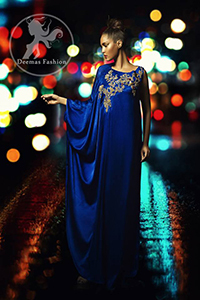 Tags: Gown, Party Wear, Pure Silk, Royal Blue, Semi Formal. Gown has been adorned with embroidered bodice. Work includes kora, dabka, stones, sequins, beads,resham and swarovski crystals.